“When Achieve Australia (Paul’s disability support group) suggested he be engaged in some level of employment my thoughts were “Good Luck with that idea “. I was soon proven wrong. When they suggested he could go from two days a week to three my thoughts at the time were pretty much the same. How wrong can a person be? At our meeting Paul was so keen to get to work, his skills sets have been developed to a degree I could never believe as has his social skills, level of independence and self-esteem. Paul Perazza’s (Supported Worker) brother and primary advocate. “Thank you to local business CNS Precision Assembly for showing me around on a bustling Monday morning. 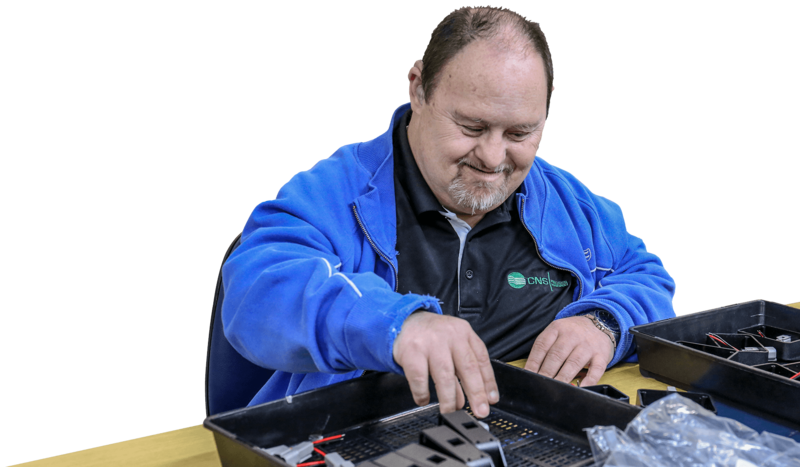 As an electronics manufacturer based in Hornsby, CNS gives Australians with disabilities the opportunity to join the workforce and participate in the real economy. These workers are trained to undertake the routine steps that are required in the manufacturing process.